Background & Aims: Sofosbuvir is a powerful drug for the treatment of hepatitis C virus (HCV) infection. In comparison to preceding remedies, sofosbuvirbased regimens provide a higher cure rate, fewer side effects, and much lower duration of treatment. The aim of the work was to assess the efficacy and safety of sofosbuvir plus ribavirin with or without peginterferon-alfa in the treatment of a cohort of Egyptian patients with hepatitis C virus infection. 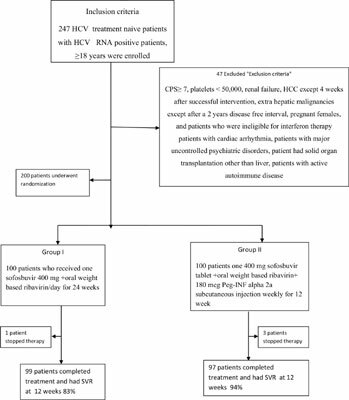 Methods: Two hundred treatment naive patients who were HCV-antibody positive and HCV RNA by PCR positive aged more than 18 years were enrolled in the study and patients were classified into two groups: Group I which included 100 patients who received dual therapy with sofosbuvir plus oral weight based ribavirin for 24 weeks and Group II which included 100 patients on triple therapy with sofosbuvir plus oral weight based ribavirin (as with the dual therapy) and a 180 mcg Peg-INF alpha 2a subcutaneous injection weekly for 12 weeks. The primary end point was a sustained virological response at 12 weeks after end of the treatment determined by quantitative PCR for HCV. Results: Both patients groups had high sustained virological response that was higher in patients receiving triple than dual therapy (94% vs 83%). The adverse events that occurred in the two groups of patients were more evident in a group of patients receiving triple therapy. The side effects were mainly flu like symptoms. Keywords: Sofosbuvir, pegylated interferon, ribavirin, Egypt, virological, PCR, HCV. Keywords:Sofosbuvir, pegylated interferon, ribavirin, Egypt, virological, PCR, HCV. Abstract:Background & Aims: Sofosbuvir is a powerful drug for the treatment of hepatitis C virus (HCV) infection. In comparison to preceding remedies, sofosbuvirbased regimens provide a higher cure rate, fewer side effects, and much lower duration of treatment. The aim of the work was to assess the efficacy and safety of sofosbuvir plus ribavirin with or without peginterferon-alfa in the treatment of a cohort of Egyptian patients with hepatitis C virus infection.